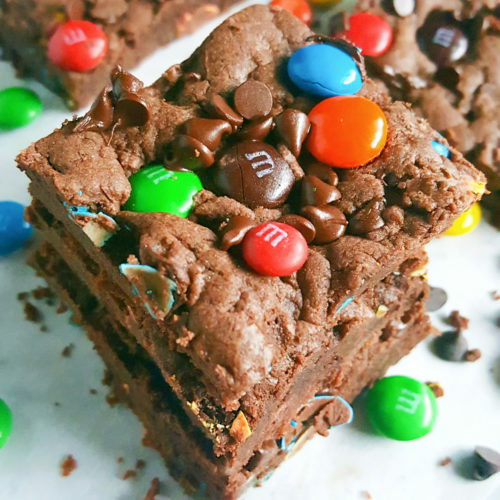 Cookie meets brownies in these decadent double chocolate chip m&m cookie bars made with cake mix. They’re soft, chewy, buttery, dense, and rich in chocolate flavor. Bake these bars and get a double dose of chocolate in just 20 minutes! If you want something amazing without having to do all the work, this is it. You should’ve seen the look on everyone’s face when I pulled these out the oven. “Ouuu, those look good” and “mmm what are those?”. This is another one of my cake mix recipes and definitely one of the best. All of my cake mix recipes are super easy and this one is no exception. You only need 5 ingredients. Yep, that’s it. It’s such an easy recipe to make. You just make the dough, press it into the pan, and bake! You’ve got decadent chocolate cookie bars right in front your face in 20 minutes. No one will guess that these rich chocolate cookie bars are made with a plain old box of cake mix. 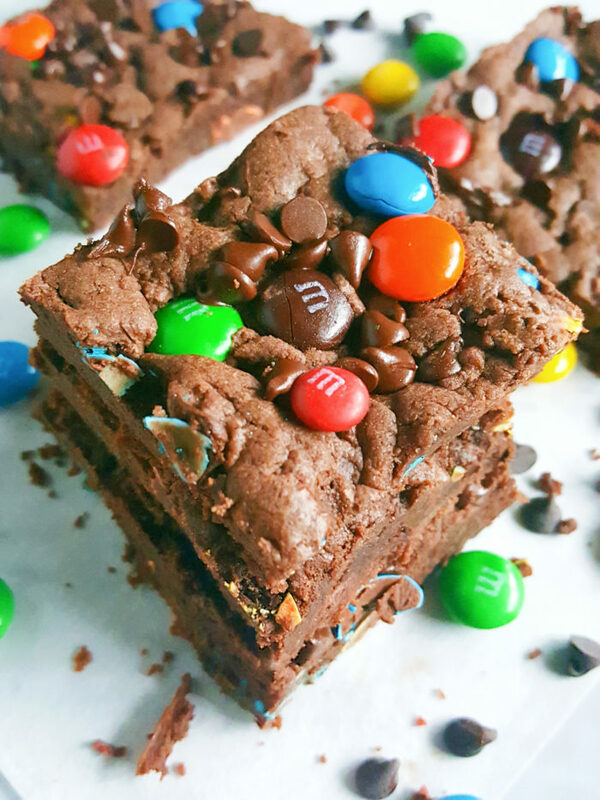 After having these m&m cookie bars I thought I’d try the chocolate version since they came out so great. Of course this version is bomb as well. Some might argue that they’re even better. They’re richer for sure. Also, these bars are just these chocolate cookies in bar form. Both are so good; very fudgy and brownie-like. Stuff them with rolos, top with a scoop of ice cream and they are just heavenly! It was a very rainy and gloomy day when I took these pictures. I’m still surprised that they look as good as they do. I rely heavily on the sunlight for pictures because I don’t use artificial lighting at all. It’s way too harsh. 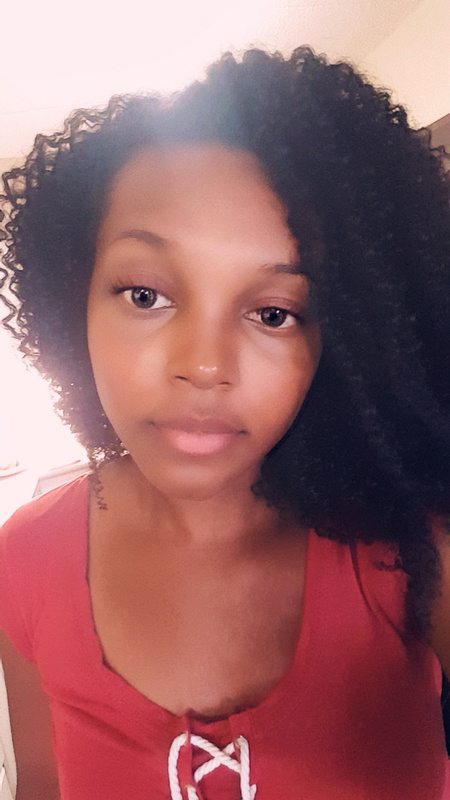 Natural light is the best. I really had to work quickly because the more time went by the more rain clouds appeared. I was determined though because I hate having to redo pictures. After you’ve set everything up and got into that “pro photographer mode” there’s really no going back. I really feel like I’m getting more serious now because this is the very first time I didn’t devour most of my subjects. I’ve been baking so much that I’m starting to feel like my kitchen is a factory. I just keep pumping out baked good after baked good. Yesterday I made these cream cheese chocolate chip cookies and I ate so many of them. I really need to pace myself. Originally, I was just gonna add chocolate chips alone but there was a bag of m&m’s up in the cupboard just begging to be used. I got that bag months ago and I hadn’t figured out a good way to use them so this was perfect. I used mini chocolate chips because that’s what I had on hand. I wasn’t too happy about it though because I thought they would look a little odd up against the big, bright m&m’s but I was very wrong. The mini chocolate chips got into the little nooks and crannies making these even more sinful. And I just thought I’d note that as with all my cake mix recipes, these cookie bars have no added sugar. Hooray! The cookie dough for this recipe is very thick so it’s hard to press and spread it into the pan. It’s going to seem like there isn’t enough but trust me, there is. Just take your time and plop spoonfuls of dough into the pan and spread it with the spoon or your hands. Make sure you fill up all the empty spots and push it all the way to the edges. 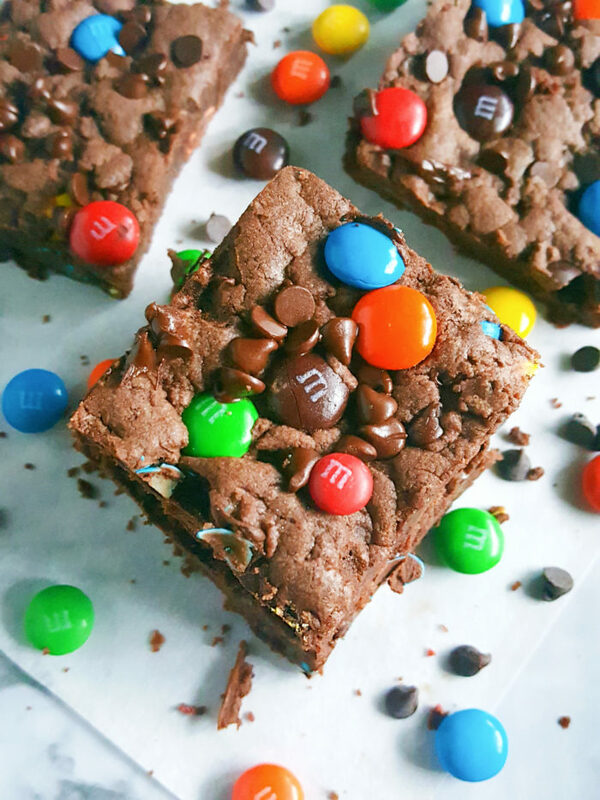 I chose to bake these in a baking pan because I always find that cookie bars taste better when baked in a baking pan than in a glass baking dish. The texture is significantly different. They’re more cake-y when baked in a glass dish. You already know I don’t like cake-y cookies. Also, I only use Devil’s Food cake mix for these types of recipes because I find that it produces a better end product than Chocolate Fudge. The Devils’ Food is richer in flavor, darker and produces softer dough. It’s intense and that’s why everyone loves it, including me. Under baking these bars is key. It’s hard to tell when they’re done. They’re going to be puffy and extremely soft when you pull them out of the oven but you need to fight your instincts and leave them out the oven. The one and only way you can tell these are done is by checking the edges. If the edges are firm or feel done, even if a huge majority of the center is under baked, take them out! The cookie bars sink, firm up and finish “baking” as they cool. If you over bake these they will most likely be tough and dry and that’s sad. It’s crazy how this dough just doubles in size though. It goes into the pan in such a thin layer but it bakes up so big and puffy then it sinks and becomes deliciously chewy and dense. They’ll look so delicious right when they come out the oven and you’ll want to dig right in but you have to wait. This is definitely the hardest part of this recipe. You have to wait a whole half hour. It can be gruesome because the rich chocolate aroma is going to travel all through the house. You can’t ignore it. 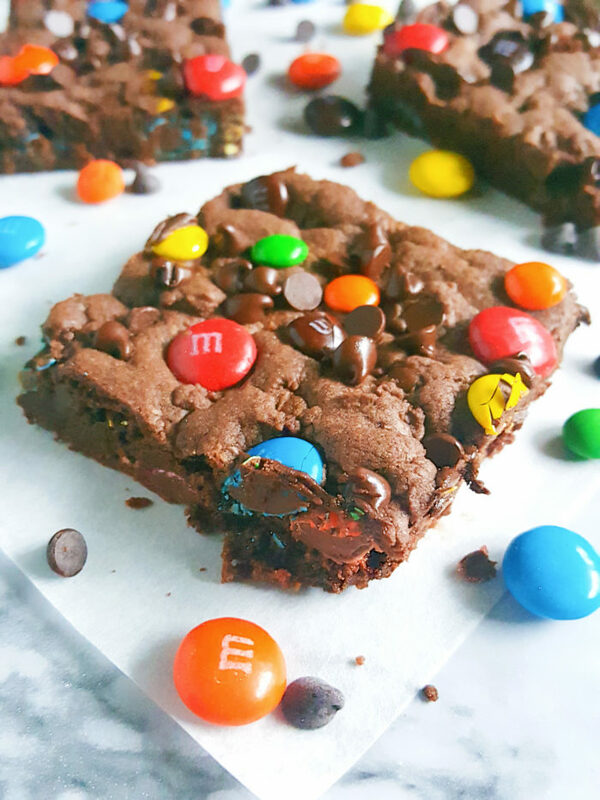 The chocolate chips will be all melt-y and the m&m’s are so eye catching you might find yourself staring at these for longer than you want to admit. I couldn’t even dig right in after they were cooled either because I had to take pictures. 😢 So I just basically ate the whole edge. Yep, I cut all the edges off and ate them. My kids saw me removing big stick pieces out of the pan and they were so confused. 😂 If you think I’m going to wait hours before having a bite you must be mad. I’m so glad I added the m&m’s though. These bars are really soft so they needed that crunch. They’re so yummy. Better get your glass of milk ready! Preheat oven to 350°F. Line a 9x13 inch baking pan with parchment paper and set aside. In a large bowl combine butter and egg. Add cake mix and stir until dough is formed. 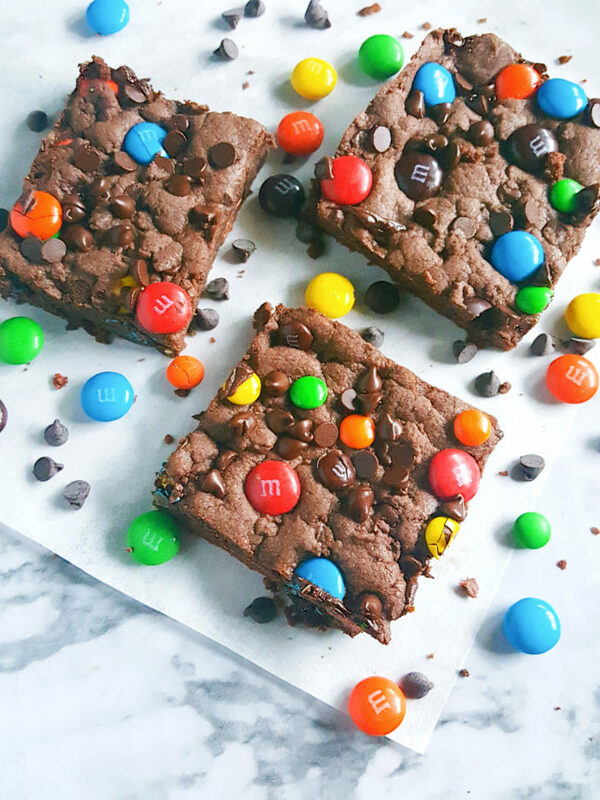 Gently fold in 1/2 cup M&M’s and 1/2 cup chocolate chips. Press dough into the baking pan in an even layer. Sprinkle and press remaining 1/4 cup M&M’s and 1/4 chocolate chips into the top. Bake for 10 - 11 minutes. DO NOT over bake. *Bars are done when the edges are set and the center is soft and under baked. Cool in pan for 30 minutes. Cut into squares.